Scraperite Plastic Razor Blades: The razor blade alternative! You are here: Home / Car Care Products / Scraperite Plastic Razor Blades: The razor blade alternative! Scrape safer with Scraperite Plastic Razor Blades! 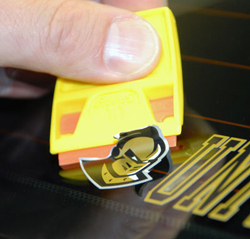 The next time you need to remove a sticker from your vehicle’s paint or glass, use a Scraperite Blade. ScrapeRite Plastic Razor Blades are hard plastic, double-sided razor blades with an easy-to-grip handle. ScrapeRite Plastic Razor Blades do all the jobs for which you’d use a regular razor blade, but the plastic blades are much safer on paint, glass, plastics, chrome, and all other surfaces. A steel razor blade can easily and deeply scratch auto paint, window tint, or chrome but ScrapeRite Plastic Razor Blades can do the same jobs with less risk of scratching or gouging. The automotive uses are endless! The orange general purpose ScrapeRite Plastic Razor Blades are strong but flexible to conform to curved surfaces. ScrapeRite Plastic Razor Blades are available in quantities of one, five and 25 with a blade holder or in a pack of 100 without a blade holder. Click here for a full list of uses for ScrapeRite Plastic Razor Blades!